What is the Plantar Fibroma? A plantar fibroma is a fibrous knot (nodule) in the arch of the foot. It is embedded within the plantar fascia, a band of tissue that extends from the heel to the toes on the bottom of the foot. A plantar fibroma can develop in one or both feet, is benign (non-malignant), and usually will not go away or get smaller without treatment. Definitive causes for this condition have not been clearly identified. The characteristic sign of a plantar fibroma is a noticeable lump in the arch that feels firm to the touch. This mass can remain the same size or get larger over time, or additional fibromas may develop. 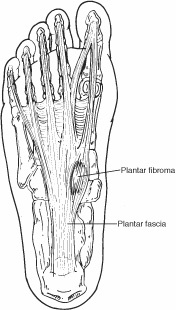 People who have a plantar fibroma may or may not have pain. When pain does occur, it is often caused by shoes pushing against the lump in the arch, although it can also arise when walking or standing barefoot. 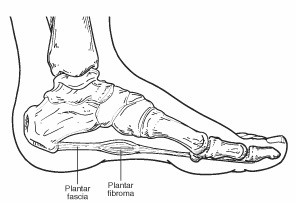 To diagnose a plantar fibroma, the foot and ankle surgeon will examine the foot and press on the affected area. Sometimes this can produce pain that extends down to the toes. An MRI or biopsy may be performed to further evaluate the lump and aid in diagnosis. Steroid injections. Injecting corticosteroid medication into the mass may help shrink it and thereby relieve the pain that occurs when walking. This reduction may be only temporary and the fibroma could slowly return to its original size. Orthotic devices. If the fibroma is stable, meaning it is not changing in size, custom orthotic devices (shoe inserts) may relieve the pain by distributing the patient’s weight away from the fibroma. Physical therapy. The pain is sometimes treated through physical therapy methods that deliver anti-inflammatory medication into the fibroma without the need for injection. If the mass increases in size or pain, the patient should be further evaluated. Surgical treatment to remove the fibroma is considered if the patient continues to experience pain following non-surgical approaches. Surgical removal of a plantar fibroma may result in a flattening of the arch or development of hammertoes. Orthotic devices may be prescribed to provide support to the foot. Due to the high incidence of recurrence with this condition, continued follow-up with the foot and ankle surgeon is recommended.